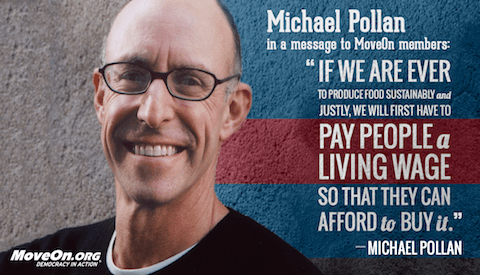 I had never heard of the concept of “food justice” before receiving e-mail from Moveon.org. I’m Michael Pollan, author of The Omnivore’s Dilemma, In Defense of Food, and Cooked. For many years now, I’ve been passionately outspoken about the food justice movement, and low-wage workers represent a key front in the fight for fair and just food. That’s why I hope you’ll join me and millions of MoveOn members across the country in expressing solidarity with the fast-food workers going on strike for fair wages today. Those of us working in the food movement often speak of our economy’s unhealthy reliance on “cheap food.” But cheap food only seems cheap because the real costs of its production are hidden from us: the exploitation of food and farm workers, the brutalization of animals, and the undermining of the health of the soil, the water, and the atmosphere. As a society, we’ve trapped ourselves in a kind of reverse Fordism. Instead of paying workers well enough so that they can afford good, honestly-priced products—as Henry Ford endeavored to do so that his workers might afford to buy his cars—we pay them so little that the only food they can afford is junk food destructive of their health and the environment’s. If we are ever to right this wrong, to produce food sustainably and justly and sell it at an honest price, we will first have to pay people a living wage so that they can afford to buy it. Let’s start with the people who work so hard to feed us. Please stand with the brave fast-food strikers by sharing this image on Facebook. P.S. There are nearly 100 fast-food worker rallies at 12:30 p.m. local time all across the country today. Head over during lunch and show your support in person. Click here to find a rally near you. Henry Ford did not decide to pay his workers the then exorbitant wage of $5 per day solely out of humanitarian concerns for his workers. He wanted to eliminate the heavy turnover in his factories and to attract the best workers he could. It was a shrewd business decision on his part that also gained him a great deal of good publicity. There was a slightly dark side to his benevolence. The $5 a day wage only applied to workers who had six months employment at Ford’s factories and were of good moral character. Ford’s Social Department investigated workers’ personal lives to ensure that they qualified. But enough of Henry Ford. Mr. Pollan’s argument is that we must pay fast food workers higher wages so that they can afford to buy higher priced sustainable food to eat instead of the crap they are already eating. I am not sure he has the best interests of those workers in mind, however. I am not sure too many of these workers are all that interested in sustainable food. They, quite naturally, would prefer to be paid higher wages. Now, the question is, is there labor worth the higher wages? Ford’s factory workers proved to be worth the high wage he paid them, other wise Ford would have had to discontinue the program or go out of business. Ford was trying to attract skilled workers as well as unskilled workers willing to work on an assembly line for 8-12 hours a day. Not many fast food workers can be classified as skilled labor. Many of them do not have all that much in skills or experience to offer an employer, otherwise they would be working elsewhere. The question is, will doubling their wages result in increased productivity that will increase the value of the company that employs them. If yes, than they will do well. If no, than the company will have to increase prices, considering that people go to fast food restaurants because the food is fast and cheap, and no for the fine dining experience, there may be limits on how much they can raise prices. They can also reduce expenditures. The company can close stores that are no longer profitable. They can decide not to hire as many people and to automate as much as possible. It may well turn out that the fast food workers that Mr. Pollan claims to care about will find themselves hard pressed to afford junk food, much less the sustainable food he wishes them to eat. I can understand why supporting higher wages for fast food workers is popular, both politically and emotionally. It feels good to support the little guy, the hard-working people who aren’t being rewarded properly for their efforts. It costs nothing, since you do not have to worry about how the companies are going to handle the increased payroll expenses. Indeed, you can simply assume that the companies have infinite amounts of money to spend or that they need not show a profit. But, feeling good does not necessarily make good policies. You must consider the consequences. Even the most well-intentioned policies can have disastrous consequences and hurt the people they are meant to help. Fast-Food Workers Cry Poverty Wages As McDonald’s Buys Luxury Jet (npr.org) The cost of that luxury jet is probably minute compared to what McDonald’s pays out in wages, but you would think some one at their corporate headquarters would realize what bad publicity something like that brings. This entry was posted on December 5, 2013 at 9:04 pm and is filed under Economics, Idiocracy, What's Happening. You can follow any responses to this entry through the RSS 2.0 feed. You can leave a response, or trackback from your own site.